In “Dirty Science,” Harvard educated Bob Gebelein discusses corruption in the scientific establishment in regard to accepting scientific research outside of the realm of physical science. Gebelein is dismayed to see the current trend of people who are viewed as scientific authorities being placed upon a pedestal of infallibility, where they can discount someone else’s research without needing to offer proof using scientific method. These scientists focus on physical science, which can be seen and proved by physical evidence, as being the only true science. Anyone reaching beyond this limited viewpoint by exploring areas outside the accepted physical beliefs is ostracized and shunned to the point of being denied publication, funding for research and even employment. These fear tactics have become the norm – the result blocking our entire culture from the benefits of scientific exploration in the mental and spiritual realms. 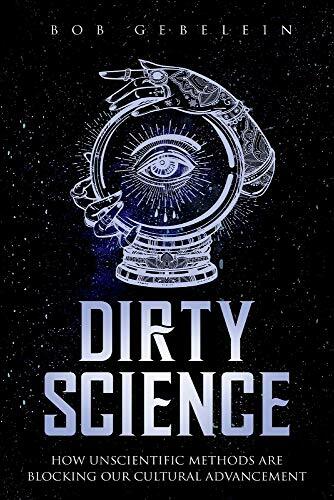 This book was written to educate readers about this issue of “Dirty Science,” so that they can recognize when unscientific methods are being used to discredit someone. While “Dirty Science,” is a discussion about science and the importance of using the scientific method in research, you do not have to be a scientist to follow this. Gebelein does an excellent job of explaining what the reader needs to know to understand the severity of the issues presented. His style of writing is very easy to follow, even though he is discussing a complex matter. He also does not discount valid scientific research, he just wants “the experts,” to acknowledge that there is scientific evidence that validates science that goes beyond physicalism. His education and dedication to research demonstrates that his findings are credible. Like Gebelein, I do believe in science, but I also believe that science exists outside of the realm of physical science and that researchers should have an opportunity to present their research without fear of their careers being ended. It is important to note that the author discussed valid research that has been done in the area of parapsychology. I personally have had many experiences that I have been unable to explain. I know that there are many others like me. I want to be able to refer to valid research to get an idea of what I might have been experiencing. As long as credible researchers are discouraged from sharing research in outside of physicalism, our resources will be limited. I look forward to reading several of the sources that are mentioned. “Dirty Science,” would be an excellent textbook for critical thinking courses. I participated in a critical thinking course at California State University, Fresno. This course was titled, “Science and Nonsense.” It was taught by two physicists - one believed in a higher power and the other did not. This book would have been a perfect reference for that course! It was fascinating, and both professors approached the topics discussed with open minds. I am so grateful that I had that opportunity, because “Dirty Science,” is a reminder that this is rare. Having enjoyed “The Mental Environment,” also written by Bob Gebelein, I am pleased to recommend “Dirty Science.” It will open reader’s eyes.